"Krzemionki", prehistoric flint mines is part of the Tentative list of Poland in order to qualify for inclusion in the World Heritage List. Back in Aug 2015, our visit to Spiennes had been enhanced by a talk from a Polish academic who was assisting with the ongoing excavations there and just happened to lecturing on “Flint mines in Poland” to a gathering of specialists that afternoon in the lecture hall at the Visitor Centre. We were invited to attend and began to realise just how much there was to know about this subject! Mention was made of the flint mine at Krzemionki and I mentally “pencilled in” an intention to visit it if I ever found myself in that part of Poland…… thus it was that we were there just over 2 years later in mid Sep 2017 at opening time! The site is situated around 8kms from the industrial city of Ostrowiec Swietokrzyski. We were travelling by car in a reasonably straight line between Bialowieza (c300kms NE) towards Krakow (still another 170kms SW) - and currently there isn’t a single WHS in this part of Poland between the 2! Apart from Warsaw and Torun, Poland’s WHS are mainly scattered around its periphery and there seems little reason for non Polish tourists to visit the area other than to “pass through”. We were somewhat surprised to find a large modern visitor centre set in this nondescript countryside. It turned out that over half the visitors to the site are Polish school children. The site also includes a “Nature Park” and a reconstructed “Stone Age Village” and is linked with an Archaeo-geological trail in the region including tetrapod tracks at Zachelmie. But on this morning, we were the only visitors and, having paid our reduced “old fogie” entrance fee of 12 zloty pp, we were allocated our personal English speaking guide for the tour – which, in our case, lasted about 90 minutes but is normally scheduled at c75! A very different situation from that which we were to find the next day at Tarnowskie, where non Polish language tours cost extra and any group of less than 20 has to cover the standard overall total cost via extra fees with a minimum of 4 PAX per group. We were asked to wait 30 minutes until 9.30 for the “tour” to start - possibly with the hope that more would join! In the mean time the museum provided quite a good exhibition which was unfortunately captioned only in Polish. I asked how Krzemionki hoped to differentiate itself from Spiennes. The picture which emerged was that it was currently intended to present it as a “Relict Cultural Landscape” consisting of 3 flint mine areas (one of which was to be Krzemionki) together with a related Neolithic settlement. I was given the names of the extra locations as “Korycizna”, “Borownia” and “Gawroniec” (this latter being the “settlement”). I have been unable to discover much about these on the Web, though all 3 are mentioned in this (very!) academic downloadable article from 1995. It is perhaps worth mentioning that it is thought that Neolithic peoples didn’t actually live at Krzemionki – mainly because of the lack of water. Instead their settlements were 15kms + away and the workers at the mines required a degree of “support” to keep them fed and watered in their work! Whether this will be enough to enable Krzemionki to establish a unique “value proposition” is another matter. Spiennes includes 3 zones of mines, albeit within the same boundary, and in its “comparative analysis” the AB review refers to it being “The only mining site directly associated with a settlement characteristic of the period”. The 2 sites would then be “trading” claimed superlatives – “most ancient”, “widest range of mining techniques”, “size” etc. But Spiennes got in first and has already claimed many of these – we will see. Perhaps there should be room for multiple Flint mines as per Silver mines, Wooden Churches etc etc! The tour at Krzemionki consists of a trail through the 4 types of mining techniques. The simplest - “Open Pit”, is only visible in the form of depressions in the ground which can be seen from the walkway, but the other 3 (“Niche Gallery”, “Room and Pillar” and “Chamber”) are displayed in more detail. An example of the first is protected by a building and consists of a large wide pit around 5m deep, viewable solely from above, from which side galleries can be seen leading off. It is, we were told, a genuine mine, albeit with sides and edges “stabilised”. Some resin prehistoric figures were beavering away down below! The second, protected by another building, consists of a narrow vertical shaft covered by a replica wooden “tent” which archaeologists believe provided cover for those working there both underground and knapping on site at the surface - only the entrance to the shaft is visible but the guide explains the relevant factors such as the problems in supplying air underground when firebrands were used to provide some light. The third is the “speciality” of Krzemionki, and is reached by descending around 10 metres down a spiral staircase and following a tunnel of some 500 metres. At first this is totally modern, but it then breaks in to an original mine chamber. At this point the side galleries around 1m high can be seen, but a “walkway” through them has been created by deepening the original chamber to “standing height” to create a “path” leaving the original roof and galleries on either side intact. This was done when the mine was originally opened to large scale tourism in the 1980s. One wonders if it would be done today. But there appears to be no shortage of mines so I guess that partially “destroying” the integrity and authenticity of one in order to provide “education” is justified? In any case it has been done and it will be interesting to see if ICOMOS makes any comment. The flint in the Krzemionki layers (3 of them each around 1m apart) is known as “Striped” or “Banded” because of its alternating dark/light bands and is different both from that at Spiennes and in some other flint mining areas in Poland. The underground chamber walls still contain many partially exposed, rounded whole and shattered nodules. The flint possesses a fine pattern when split/polished but was actually less good for tool making than some other types – particularly for larger axes. Today it makes fine shaped and polished jewellery but was of no use for this purpose by Neolithic man as it couldn’t be drilled. There is even a suggestion that it was prized more for use as grave goods than for working tools. We were told that burials of the period almost always included flint grave goods and examples of traded Krzemionki striped flint have been found several hundred kms away. At one point in the walk, a “bell chamber” is entered with a narrow neck up to ground level (now securely "capped") which, in the earliest days of tourism at Krzemionki (from late 50s until the creation of the underground route), was used as the entrance to the chamber via a vertical ladder in much the same way as Spiennes is entered currently. 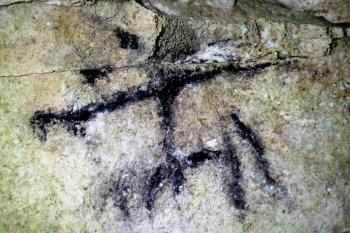 Finally, a “unique” aspect of the Krzemionki tour is reached – a charcoal “drawing” on a pillar of what appears to be a human figure (photo). This is similar (but not the same?) to that used as the “logo” for Krzemionki but I haven’t been able to discover photos of other drawings in the mines of the area which are supposed to exist. The existence of this artefact explains the site’s concern about the potential for growth of algae etc underground and the installation of LED lights - however, unlike at Spiennes, underground photography is allowed, albeit without flash. The much larger numbers of visitors at Krzemionki must also create moisture problems - the avoidance of which is used at Spiennes as a reason for restricting the number of underground visitors. Finally one climbs another spiral stair case to enter the last building which concentrates on the final years of mining at the site in the early Bronze Age. The site was then abandoned and “disappeared” until it was rediscovered in 1922. So - how to compare the “visit experience” as between Krzemionki and Spiennes? At the time it was nice to walk underground, but perhaps, on reflection, the vertical ladder descent at Spiennes into the chamber which has not been developed/enlarged for viewing by tourists actually provides a better impression of what the mines were really like! Krzemionki has the pictogram to see and perhaps a better museum exhibition. The ease of getting on a tour favours Krzemionki also. Whatever - we don’t regret our visit and didn’t feel that it simply duplicated what we had heard/seen at Spiennes. We were lucky of course to get a personal tour in English and, with the background knowledge about Flint Mining already obtained at Spiennes and in follow up studies, felt that we were able to develop/consolidate our understanding of Neolithic Flint mining.